We work with a number of school groups as well as individual independent schools; commissioning a single company for all of your schools’ designs ensures that they have a consistent theme and quality to the architecture. We can also use the same layout with different branding/imagery to make the work far more cost effective. 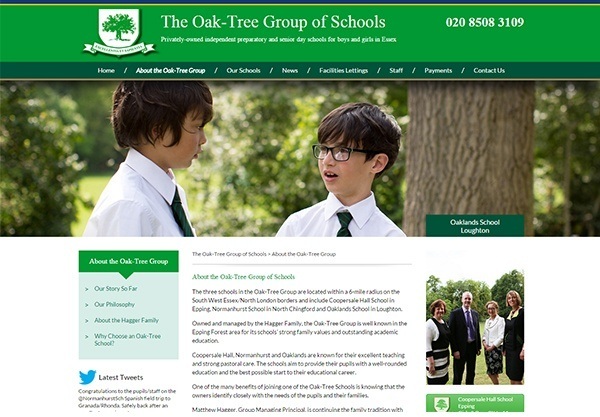 The Oaktree Group came to us because their CMS was not flexible enough (a fairly common complaint among schools) and their on-site SEO was poor. The architecture of the site was completely flat, which meant that there was no real structure to it. We worked to create a sound page architecture for every school, as well as adding social media integration and creating school apps. As with most schools, they needed to make the most of their budget. That’s why we suggested using the same layout for all of the school sites so that they paid less for the design overall. 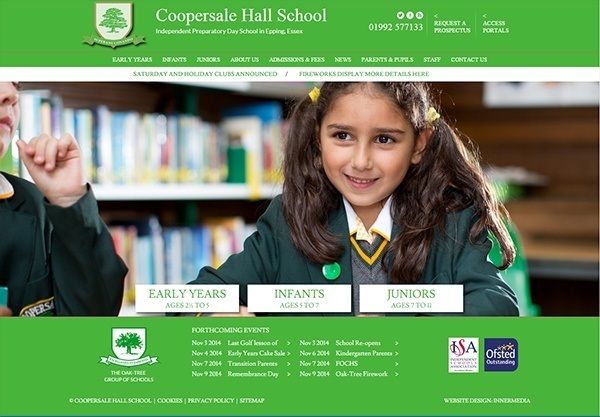 Using our purpose-built SchoolCMS helps to make their day to day site management more efficient too, so their staff can make updates without getting in touch with a designer or developer for support. 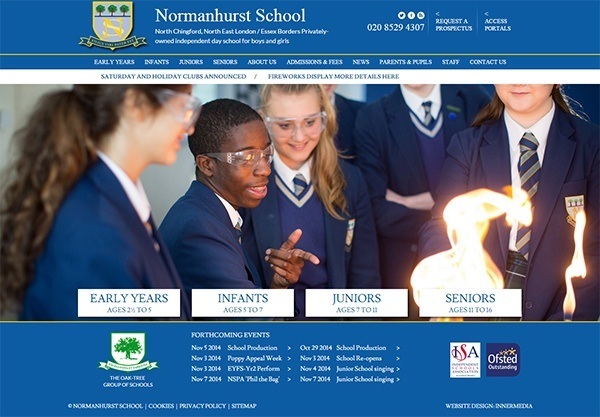 The group website has a slightly different look to the main school sites to make sure that it stands out and provides the experience that users expect. Different colours and imagery let the schools put their own mark on each site. While a consistent layout reinforces the fact that they’re part of the same group and helps save money. Our CMS lets schools easily update the banner images and content when necessary. The two main visitor groups for school sites are prospective parents and existing parents – while there is some overlap in their content, most of the time you can easily separate their journeys to make your site more streamlined and user friendly. A school app takes the majority of existing parents off the site entirely by providing an easily-accessible hub for all of your information. Apps are extremely pared down when compared to the site and feature the information that parents want to see on a day to day basis; lunch menus, calendars, etc. There are a number of ways to set up, market, and distribute your app – talk to us about your options.